It was Christmas tree-trimming time in our house this weekend. The kids actually agreed!!! to get a tree on Saturday and trim it on Sunday. The trip to the nursery to pick out a tree went pretty much exactly as it has for the last four or five years. From the moment we arrived, Riley ran off the find the biggest, most expensive trees, the ones that wouldn’t even fit through our front door let alone under our living room ceiling. She asked several times if we could get one of the giant trees. When we finally get her to look in the section that was in our price and size range, she wanted to inspect a hundred trees before deciding. She wanted to look at the wreaths, the ribbons, and the mechanical wicker reindeer. Ryan? From the moment we walked in, he was counting down the time until we could leave. These trips used to end in tears, Ryan angry at having “wasted” so much time, Riley angry at having her experience short-changed, and Veronica and I sad that the Christmas spirit eluded our son. In a nod to progress, this time Ryan appeared to recognize that the trip was important to us, and so there was not nearly as much complaining about how long things were taking. Instead, every tree we pulled out he uttered some variety of “that looks great let’s get it” before expressing disappointment when we put it back to inspect a different tree. Now, I don’t have a ton of patience for this exercise either. So I looked at four or five trees. When I noticed an attendant ready to help us in the crowded store, I quickly grabbed one and told him we were ready. The outing was completed in under 30 minutes, including the time it took for the attendant to secure the tree to the roof of our car. Back home, Ryan settled in to watch the entire Army-Navy game. His total embrace of football, both college and pro, is really remarkable. Before this season, he had never willingly watched an entire football game — other than one I dragged him to as part of a grand road trip. Now he watches — and engages with — nearly any game. It’s not that I’m thrilled about my son spending hours in front of the television, but his new-found love of the sport represents progress in many ways. He has opened his mind to a new interest. 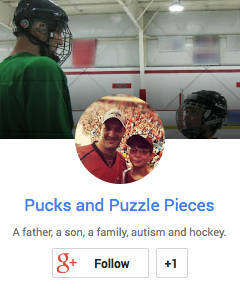 No matter how narrowly separated it is from his hockey obsession, it is still evidence that he can adopt new pursuits — something we point out to him regularly. Also, for a child whose motor runs as fast as Ryan’s, the ability to sit and watch anything of length is a good thing. We still haven’t made it through too many movies without boredom setting in, but a football game? No problem. I’m also happy that Ryan doesn’t just watch the games, he absorbs them. He asks constant questions, and as soon as I explain a new situation or rule to him, he commits it to memory. As a result, when he yells at the TV, he sounds like a seasoned fan. That was Saturday. Sunday’s schedule called for Ryan’s hockey game in the morning, followed by our new NFL routine. He dressed in his New York Jets shirt in time for the kickoff at 1 p.m. and we sat side-by-side on the couch for the next three hours, he watching the Jets on the TV, me watching the Buccaneers on my iPad. We kept an eye on each others’ games, high-fived the good plays and commiserated over the bad ones. It was a split result. His Jets beat Jacksonville and remarkably remain alive in the playoff chase, while the Bucs blew a late lead, ultimately losing to the Eagles on the final play to pretty much end any chance they had of making the playoffs. Ryan knew we were going to decorate the tree Sunday. We promised to wait until after the Jets game. He wanted a little time for himself, so we agreed to wait until 5:30, but he was clearly trying to avoid the activity. Tree-trimming with Ryan has never been easy. In past years, he has either shown no interest, or rushed through the activity with such detachment that he breaks a bunch of ornaments, upsets Riley, and pretty much gets in the way. I recall last year as having gone somewhat better, but this one was not shaping up so well. Ryan was ready with any number of excuses, including a highly suspect “knee injury” that arose out of nowhere. We weren’t having it. I was not going to push him to the point that it ruined one of Riley’s favorite activities of the year, but I also had no intention of having such a typical family experience pass without any involvement from him. When things started to get testy before we even began, it was time to try a new approach. I reminded Ryan of the result of some of his recent meltdowns. I told him to recall how awful he felt when he realized how disappointed we were in his behavior. I told him that decorating the tree together was a very important activity for his mother and me, and to please avoid doing anything that would leave him feeling the same way. His resistance dropped enough that we were able to get started. There were some compromises. Instead of Christmas music, the soundtrack was the audio from the Giants-Packers game in the next room. Once again, Ryan scurried about the tree like a tornado, grabbing fragile ornaments and hanging them without care, often on the very end of a small branch he had already overloaded with several others. He bumped into the tree constantly as he moved around it. Ornaments began to fall. As we opened each new box of decorations, he tried to grab them out of Veronica’s hands before she could even attach hooks. He was trying to set a world record for tree-trimming. Veronica finally hit on a task he embraced — hanging the candy canes — while the rest of us dealt with the ornaments. He still rushed, but at least nothing was broken in the process. Within a half-hour, we were done. It wasn’t perfect. Nerves were frayed. It wasn’t the storybook family Christmas activity that either Veronica or I held as the ideal. But we did it. We pushed Ryan to take part, and he did. There was no screaming. There were no tears. It’s not a Christmas miracle, but for our family, for right now, it’ll do. NOTE: I know the Christmas Carol is titled “O Christmas Tree.” The title of the post is pun. See what I did there? The tree looks very nice. Glad that all went very well. 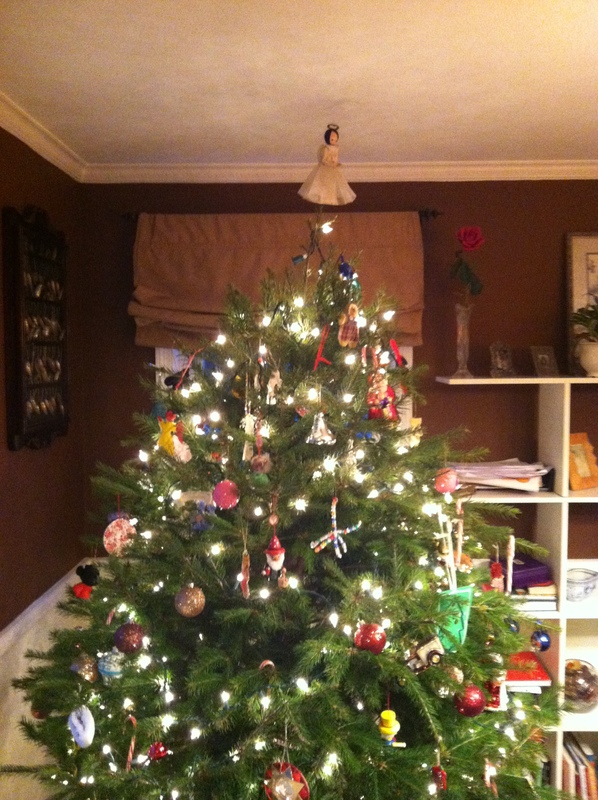 Not sure I would go with “very” well … but we survived it with tree, (most of) the ornaments, and our sanity intact.